About 10 miles of London's rivers are to be restored to their natural state to help wildlife and reduce flooding. Many tributaries of the Thames have been affected by the building of concrete channels to combat flooding and allow urban development. 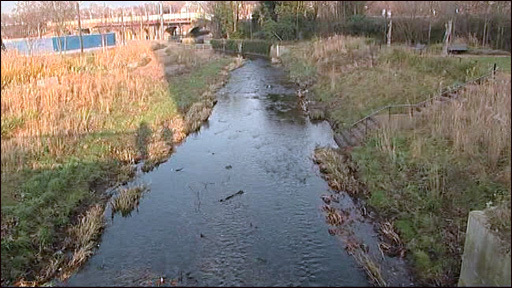 But the London Rivers Action Plan aims to restore 9.3 miles (15km) of the capital city's rivers to a natural state by 2015. The rivers include parts of the Roding, Wandle and Colne. It is hoped the restoration will encourage species including otters, water voles and kingfishers in the city. It also aims to provide areas for local residents to visit and enjoy nature and help the capital cope with the impact of climate change such as flooding. Nearly 14 miles (22.5km) of London's rivers have been restored over the past 15 years including the River Ravensbourne and the River Quaggy. The Environment Agency said restoring rivers to their original state can provide natural flood defences such as basins which absorb and hold excess water. The agency also claims in some areas restoration has even reduced anti-social behaviour. Dave Webb, project manager for the Environment Agency, said: "We are striving to improve London's most damaged rivers, and we believe we can create important habitats and improve every Londoner's life with new open spaces." Emily Brennan, director of biodiversity conservation, at London Wildlife Trust, said: "Rivers are the lifeblood of London and this plan is an important step in bringing many of them back to life." The London Rivers Action Plan is a partnership between the Greater London Authority, the Environment Agency, Natural England and groups including the Thames Rivers Restoration Trust, London Wildlife Trust and WWF UK.